Welcome to the Official website of the Albanian Tennis Federation. Photo from the club in Tirana, with Mr.Luca Santilli, special guest from ITF. More photos. 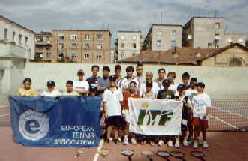 "Tennis in schools" is a project of the ITF which emphasizes the need to spread tennis in teenagers. Read more. "Tennis in the square" is another important project of the Albanian Tennis Federation. Learn to play tennis in Tirana in the "Tirana" tennis club, with coach Nallbani, the coach of the Tennis National Team under 12, 14 & 16. More info. The Albanian Tennis Federation is led by Mr.Perlat Voshtina, President of the Federation since 1996. Info. The history of tennis in Albania. Please sign the Guestbook of Tennis Tirana. Thank you. Go.to/Albania travel, music in mp3, culture, literature, fine arts, and 100's of photos from Albania. Click here.